​“Achieving the Sustainable Development Goals (SDGs) opens up US $12 trillion in market opportunities,” states the 2017 report of the Business and Sustainable Development Commission, titled Better Business Better World. This promising finding is one reason why an increasing number of companies are incorporating the SDGs into their core business strategies and operations. Contributing to these global goals helps businesses meet their own moral responsibility, and address the rising demand from their stakeholders for responsible and sustainable business practices. The publication An Analysis of the Goals and Targets, is an inventory of possible disclosures per SDG, at the level of the 169 targets. To facilitate transparency, a set of disclosures were developed – both qualitative and quantitative – based on globally accepted disclosure frameworks for businesses. These disclosures are linked to a menu of potential actions businesses can take to contribute to the SDGs. The publication An Analysis of the Goals and Targets, will be released together with the draft of the Practical Guide Defining Priorities and Reporting, at the UN Global Compact Leaders Summit in New York on 21 September. Together, the two publications are a first step towards a unified mechanism to help companies report on the SDGs in a comparable and effective way. 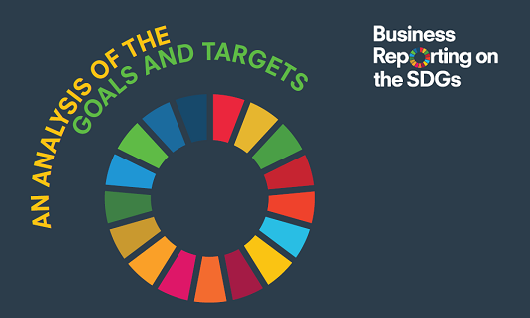 Click here to sign up for updates on GRI and Business Reporting on the SDGs.